Face is the index of your mind. But when you have slight or major deformty of the face, it affects one's ego and confidence. With advancement in facial surgery, one need not suffer anymore. Corrective facial surgeries not only imporve, enhance the face but also help to function better. Faciomaxillary or Maxillofacial Surgery is a speciality which deals with surgical correction of diseases and conditions affecting the mouth, jaws and face. Wisdom teeth are nothing but your 3rd molars that erupt in the late teen years and hence are called 'Wisdom' teeth. They generally cause problems, as there is not enough room in the upper and lower jaw for them to erupt and grow properly. 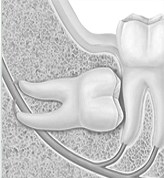 As a result of this the third molars are impacted in the bone or gum. Only if they cause pain, infection or decay of the neighbouring tooth they have to be surgically removed. Surgical removal of wisdom teeth is the most simple and commonly carried out surgical procedure by a Maxillofacial surgeon. Know more about Wisdom teeth. Dentoalveolar surgeries are minor oral surgical procedures carried under local anaesthesia. This commonly involves dental procedures and minor oral surgical procedures in medically compromised patients, exposure of impacted or hidden canines for Orthodontic treatment, removal of extra or supernumerary teeth, incision and drainage of abscess, frenectomies, removal of tongue ties etc. Know more about Dentoalveolar surgery. A dental implant is an artificial tooth root that is placed into your jaw to hold a replacement tooth or bridge. Dental implants are an ideal option for people in good general oral health who have lost a tooth or teeth due to periodontal disease, an injury, or some other reason. Click on the above link to know more about dental implants and its benefits. Know more about Dental Implants. A jaw cyst is a pathological cavity filled with fluid rarely seen in the jaws. These cysts can expand in size and weaken the bone. Sometimes they also resorb the roots of the tooth and can cause fracture of the jaws. Benign jaw tumours are also rarely seen which causes expansion of the jaws. They may initially present causing numbness on that side of the jaw or of the lower lip. These jaw tumours if untreated can become very large and may necessitate removal of the jaw itself. Click on the above link to know more about treatment of jaw cysts and tumours. Know more about Jaw cysts and tumours. Dr Girish and his team at Mukha believes in bringing in improvements to peoples faces brings in a lot more confidnece and positiveness in them. Team Mukha strives hard to educate and make our patients understand about their present condition, treatment and improvements that they can achieve by undergoing these procedures.